The most awaited Nissan Terrano is launched on 9 Oct, 2013 for Rs.9.58 lakh (Ex-showroom Chennai). This brand new mini SUV will compete against Mahindra XUV500, Tata Safari Storme, Ford Ecosport and Renault Duster. The mini SUV segment became extremely popular segment in Indian market, which is why most of the car makers are focusing in this segment to boost sales. Nissan Terrano is a Duster in a new skin however it's more expensive. This car is available in one petrol and six diesel variants. 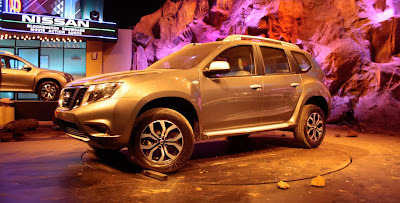 Terrano looks like the elder cousin of Duster with a new fascia. The renewed front grille with the Nissan logo looks gorgeous. The overall design of this mini SUV is similar to Duster. The interiors look up market with advanced music system, central AC vents. Some of the safety features included in this mini SUV are Brake assist, ABS with EBD, airbag etc. The interiors flaunt leather seats, wooden inserts, gear knob etc. The exteriors looks sophisticated with Nissan SUV Heritage Grille, Sleek Black Bezel Surround Headlights, tinted glass, body coloured bumpers etc. According to experts, it's one of the finest compact crossovers for the Indian roads. Ford Ecosport was one of the best selling cars in 2013 due to its price. Terrano is expensive compared to Duster and Ecosport however the Japanese automaker is confident about the performance and features integrated in this vehicle. This car will surely attract young professionals and adventurous types. Looks bigger and better than Duster but lacks the charm of Ecosport. To Know More About Nissan Terrano, Click Here: Nissan Terrano Price, Mileage, Specifications, Colours etc.